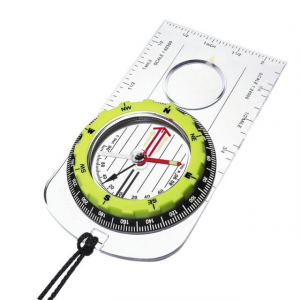 Sturdy, reliable version of the Engineer's liquid-damped lensatic compass. My Silva Lensatic 360 compass has proven to be sturdy, reliable, and accurate compass for wilderness navigation. 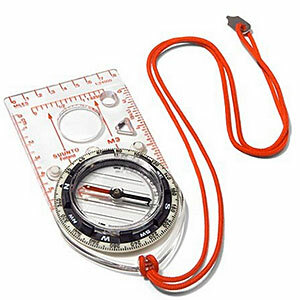 It is not made by Silva of Sweden but by Johnson Outdoors, who own the Silva brand name in North America and who source this compass from a manufacturer in Taiwan (Manufacturers in both Japan and Taiwan have supplied thousands of these liquid-damped lensatic compasses over the years, some better made than others). The design of this compass is loosely based on the late WWII version of the M1938 U.S. Corps of Engineers Lensatic Compass, a dry card (floating dial) compass incorporating magnetic induction to dampen the tendency of the dial to swing or oscillate (a derivative, the M1950 lensatic, is still issued to the U.S. military today). However, the Silva Lensatic 360 differs from the M1938 or M1950 in that the Silva incorporates an liquid (oil)-filled capsule to dampen the swinging of the compass card or dial. In the case of the Silva, this liquid damping appears to work well, allowing the compass dial or card to settle more rapidly than the dry card of the original military design. The oil-filled capsule appears to be balanced for Zone 1 (North America, Europe, Russia, Japan), but unfortunately this capsule is relatively shallow. In a far-south zone like Zone 5 (Australia), the resultant dip angle of the dial could ground it against the bottom of the capsule, introducing error, so the Silva is probably best restricted to use in Zone 1. The compass dial is graduated on the outside of the dial in degrees, using hash marks spaced at two-degree increments, with numerals every 30 degrees. In an improvement over the original design, Silva wisely had the manufacturer put the degree increments on the outside circumference of the dial and the military "mils" units on the inside, making the degree markings more prominent and easier to see. When using the lensatic sight, the compass dial can now easily be read to 1 degree by splitting the two-degree hash marks in half with the eye (99.9% of all civilian land navigators use the degree system, including search and rescue units). Quality of this compass is excellent, at least in my example, and I found it accurate to +-1 degree. The housing is made of powder-coated non-ferrous aluminum and the pivots, hinges, and thumb loop/lanyard loop are of brass or other non-magnetic metal. The bezel or cover over the capsule and dial appears to be constructed of glass and is held by a friction detent spring that 'clicks' when the dial is rotated. Like the original M1938, each click represents approximately 3 degrees, and the compass can be set to a specific heading in darkness by simply counting the number of clicks. The glass cover itself is inscribed with two luminous painted lines, a long direction indicator (direction-of-travel) line that indicates the degree heading, and a shorter auxiliary line offset 45 degrees clockwise from the longer one. To avoid obstacles or to make it easier to climb steep slopes in poor visibility without having to mentally compute course headings, you follow the auxiliary line for a certain number of paces or elapsed period of time, then rotate the short line counterclockwise 45 degrees and follow the longer line for the same number of paces or elapsed time. Luminous paint is used for the lines and arrows on the compass dial and cover glass that mark the degree heading/direction-of-travel and north indicator arrow, in order to make the compass usable in dim light or darkness. Once charged with a flashlight, these luminous marks glow for about 10 minutes, though they aren't as bright as the tritium or phosphorescent treatments used on some other compasses. When viewed with the lensatic sight, which appears to use a well-made glass magnifying lens, the user is afforded a clear view of the compass dial and direction/degree indicator line when training the compass on a landmark or target feature. The cover opens and stays in place by friction at 90 degrees for sighting, then folds and stays closed without the need of a latch. One disadvantage is that the compass dial is a bit hard to read when viewed unaided from above, as when taking a bearing at chest level (without the use of the lensatic sight). 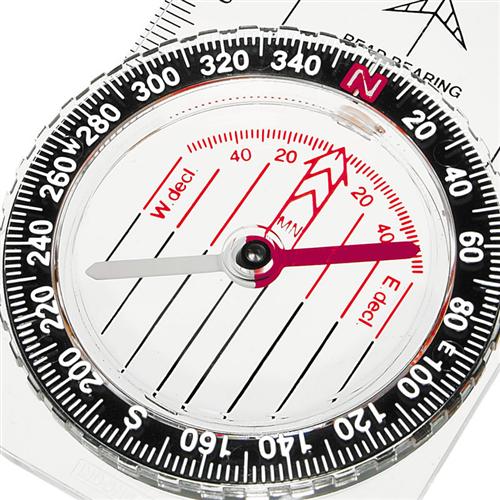 When taking a bearing using this compass, it is much easier to use the lensatic sight with the compass held at eye level. 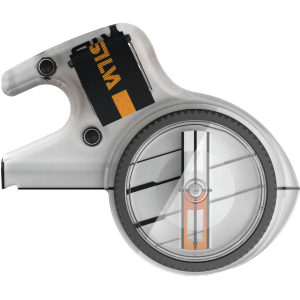 One example would be to fix one's position via resection (the technique of taking precise azimuths or bearings to two or more landmarks or targets, then drawing lines of position along those recorded bearings to fix the user's position). 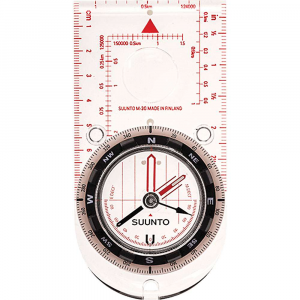 Without a straight-edge or protractor feature, the Silva Lensatic 360 is not as "map-friendly" as an orienteering (baseplate) compass, but can be used of course to orient the map to north. My particular compass has worked flawlessly in both very hot and cold conditions and has been at altitude on several hikes without formation of air bubbles in the capsule (to reduce potential damage from extreme temperatures, always carry the compass in an inside pocket in cold weather next to your torso; and in hot weather, carry it in a light-colored pouch or pocket, and never leave it in a parked car). Aside from a very skimpy instruction manual and lack of a protractor feature (as with most compass-card type compasses, a separate protractor must be carried to measure bearings on a map), I can find nothing else to criticize. 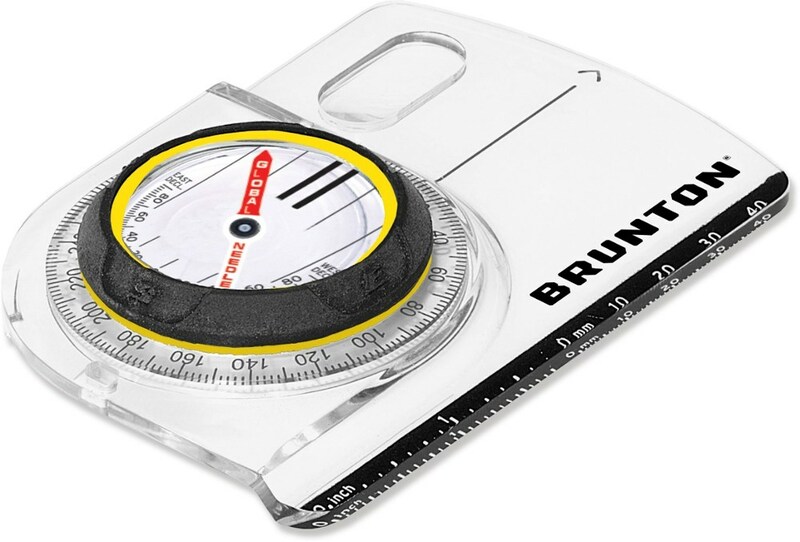 For $22, I think it's an excellent choice if you like the lensatic compass design.